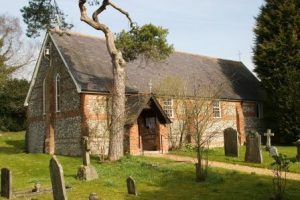 This small church was consecrated in 1856 and consists of a Nave and Chancel 58ft long by 20ft wide. There is a vestry 7ft by 4ft at the north-east corner and a covered south-west entrance porch. The walls are 13.5 inches thick, built of brick and local flint, the open pine roof being boarded and slate covered. The Church fittings include a small oak Pulpit, a stone Font with oak cover locally made and some oak panelling on the east wall behing the oak Holy Table. The church and land was given by the Burdett family and the four windows in the Nave were given subsequently by Sir Francis Burdett. All denominations use the Churchyard as their burial ground. A new brass plaque was installed in 2001 on the south wall of the Nave to commemorate both the life of Francis Burdett Fisher, a generous benefactor and supporter of the Church who died in 1993, and the donation by his widow, Mona Burdett Fisher of land to extend the Churchyard on the east side. The sculpture of Saint Michael by Ulrica Lloyd on the south wall was erected in 1964 in memory of Margaret Jane, widow of Sir Alexander Gordon. A second plaque was added in 2003 to commemorate Anne and Roger Lloyd, of Riverside House.